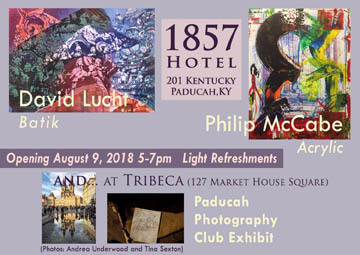 David Lucht is showing a large group of his work in exhibition at the 1857 Hotel in downtown Paducah, Kentucky. The work is both a retrospective representing nearly thirty years of his work in batik and a glimpse of his new series on Paducah architecture: “Paducah Straight On”. The opening event on August 9th, 2018 was a great evening of art, food and friends. The show is a two-person exhibition combined with another Padcuah artist Philip McCabe who has worked for years in photography and is now doing work in acrylics. The show is open to the public and is available for viewing through October, 2018.